It's always nice to have a buddy to read a series with. Especially when a book isn't really what you'd hoped for, so thanks to Arjen, for sticking with me! We both didn't like this book as much. For me it was the least in the series so far. Beloved ones: Oh yay!! I am sure now, that I still have a special liking for the characters from the first book. It's so much fun to have them reappear in this book, even though their roles aren't that big. It was great to read about them and root for them. And I like how you read more about them being Kings and Queens of Narnia. New characters: In the books before this one, the "new" characters weren't all that likeable (Eustace and Jill). In this book, they are. You have your talking horses and a boy called Shasta, who is kind and not mean or whiney. 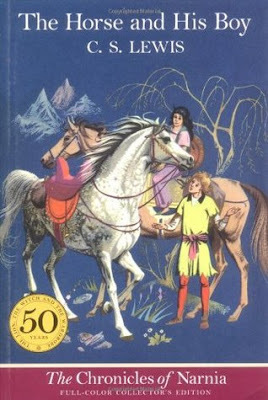 The horses were my favorites, I loved being in the presence of some Narnian characters. Battle scene: This book talks about a big war and huge danger, but I didn't feel it that much throughout the story. When the battle scene finally appeared I was happily surprised. The battle scene is described well and does have some action. Keeping in mind that this is a children's book, it was just fine! Language choice: At some point I was reading this book and I was like "Hmm, this is a children's book, what's up with the language?" I found it not that flowing at all and I'm not even sure some kids will understand the language in some of the dialogues. Especially with all the names, areas, countries, armies and stuff like that. Long: This book could've been shorter. There are some conversations and scenes that weren't all that necessary to tell the story. I remember the first book being around 200 pages and I think that this book could've been around 180/200 as well. Excitement: There isn't that much excitement in this book. Where the previous book sometimes felt short because so much was happening, this book was harder to read and had much less exciting things happening. Still not bad, pretty okay to read, but if I compare this book with the other four, I do think this was the least of them all. I do hope the other two books will be full of excitement, and that I will complain, again, that they were too short! I'd love to talk books; please let me know what you think of this book/review.